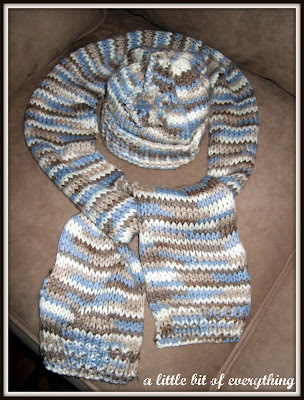 The hat pattern can be found in the pamphlet "Baby Talk" available on amazon.com and the scarf is simply knitted in stockinette stitch with ribbing on each end. Those are lovely! I have so many projects to get to, as soon as the new year is upon us. :-) Yours are inspiring! I'm a new follower from the monday hops -- just one day late. Love the colors. So cute. Love the colors. So pretty. Have a great day. This is so sweet!! I live the colors you used. What a great Baby set!! Stopping by from Rook No. 17! Hi, I really like the color combonation of the hat and scarf you created! I would like to invite you to link up to my new blog party, Masterpiece Monday, at my blog, Boogieboard Cottage. The link will be up until the 9th. I hope you can join in the fun! Beautiful colors - looks so soft and cuddly! Beautiful! the colors are GREAT! Thanks for showing us at Fibers on Friday! First of all, I love your colorful header and cute blog dress. They are such fun! And speaking of which, that scarf and hat are, too. So cute! lovely! I just learned to knit this year (been crocheting for years). The colors are so pretty and I need to add some baby stuff to my collection of patterns. Thanks for linking up to Topsy Turvy Tuesday's! oops, i just went up to the top of your blog header, clicked on follow and it said that i already follow your blog . . . i think that explains it all! Sorry! That is gorgeous! wish I could knit!